Assuming a 400-meter blast radius, what else got damaged? 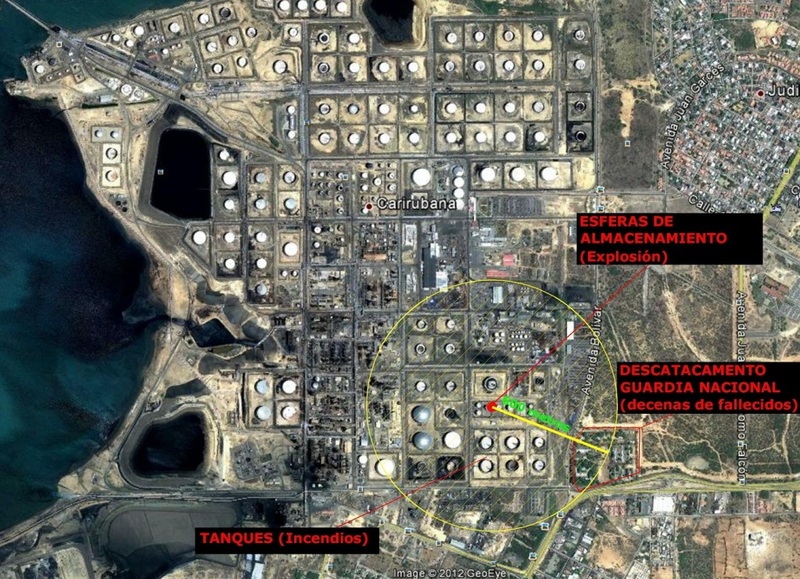 At this point, we still don’t have a clear picture of how much damage Amuay Refinery suffered overall from last night’s blast. We still don’t know precisely which facilities were damaged, and how extensively. It takes some insider knowledge of the refinery to piece this together, so I’m calling on former PDVSA workers who know Amuay to write in to [email protected] and help us out. There’s a lot of speculation right now about what the accident might mean for gasoline production at CRP, but the Complex is huge, and the most seriously affected area looks like it’s a relatively small part of the whole. So what facilities were closest to the blast site? What are we talking about, exactly? The picture above, taken from a random guy at NoticieroDigital, offers some clues. The National Guard facility that was devastated by the blast was about 400 meters from the primary blast-site. So assuming a 400 meter blast radius, what else can we reasonably assume were damaged? Mostly storage tanks? Actual Cat-Crackers and other gasoline-making facilities? What, exactly?